This weekend’s discussion of the Sony a6300 got me thinking about the iPhone’s camera, and how great it can be when wielded properly. Our own Ben Lovejoy shared his tips for taking good iPhone photos a few months ago, and now I’d like to share my 10 go-to tips for snapping better iPhone pictures. It seems obvious, but you wouldn’t believe how many times I’ve taken a photo only to realize that my lens was smudged or dirty. Always check your iPhone’s lens for debris and smudges. This is especially important for the larger iPhones, since the camera lip makes it easier to trap debris. Also, while we’re on the topic of cleanliness, be sure to clean your screen. If you can’t see what you’re framing properly due to smudges, then it can hurt your ability to snag the photo that you’re after. The iPhone features a fixed lens, and as such, doesn’t feature optical zoom. Digital zoom isn’t actually “zoom” at all. It’s just cropping the image and blowing it up. This is why images taken with digital zoom tend to be grainy and pixelated. Digital zoom has its appropriate application, but you shouldn’t be using it in every shooting scenario. Instead of relying on digital zoom, move closer to your subject. Not only will this let you capture objects up close, but it also lets you take advantage of the iPhone’s f/2.2 aperture. Getting in close and focusing on an object in the foreground or background creates separation that allows for that shallow depth of field. Just because you should avoid using digital zoom for your photos, doesn’t mean you can’t wield the feature in such a way that benefits your photography. Use digital zoom to lock focus on a specific area in frame, and then zoom back out to take the photo. Although the iPhone features a fixed aperture, it’s still possible to manually adjust the exposure, which is basically a way of changing the ISO and shutter speed values. Unfortunately, there’s no individual control over such values, and you have to simply rely on an exposure slider. To adjust exposure, tap to focus, and then slide up or down on the viewfinder. You’ll see the exposure slider move along with your swipes, and you’ll notice the image become overexposed, or underexposed, depending on which way you move the slider. Instead of just tapping to focus, tap and hold on the viewfinder to lock the exposure and the focus. While locked, you can use the exposure slider to change exposure while maintaining a locked focus. Movement can be an enemy to still photos, that’s why we have features like optical image stabilization. You can reduce movement while taking photos by utilizing the physical volume buttons to snap pictures. Better yet, connect a pair of EarPods, and use the volume buttons on the remote to invoke the shutter. For the ultimate in stability, use a smartphone mount combined with a tripod or monopod. 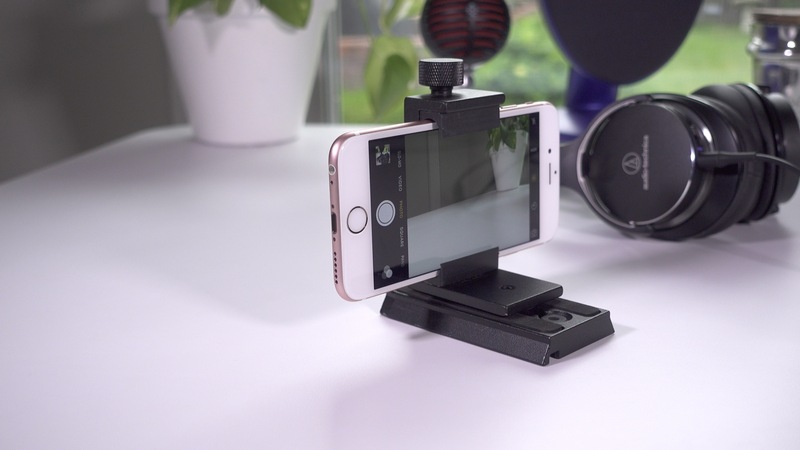 Here is a good universal smartphone mount for mounting your iPhone to a tripod. This mount can be used with any standard tripod thread. If your subject is prone to movement, using burst mode can significantly up the chances that you’ll snap a useable photo during your shooting session. Simply tap and hold the shutter button to invoke burst mode. You can also use burst mode with the iPhone’s physical volume buttons, but you can’t use burst mode via the EarPod remote’s volume buttons. HDR (High Dynamic Range) can be enabled right from the Camera app, and it works by combining three photos shot at three different exposures to create what it thinks is the most “ideal” photo. HDR works best in up close scenarios with precarious lighting conditions, or in lighting conditions where the surrounding lightning differs drastically from the lightning on the subject. To make things easier, enable Auto HDR, as iOS is fairly good at judging when your photos might benefit from this setting. Of course, there are plenty of third-party apps designed around adding more features and functionality to the iPhone’s camera. For instance, for videographers there’s FiLMiC Pro, an excellent video-oriented app that can do much more than the stock Camera app can. For photos, you can feel free to try something like ProCam 3, which lends awesome features to both still and video shooters. Be sure to check out Ben Lovejoy’s post for 13 additional tips on capturing better iPhone photos. We share some of the same ideas, but Ben covers some of the artistic and style aspects of iPhone photography that I did not, and it’s a very good read. Do you have any handy tips or tricks for getting more out of the stock Camera app? If so, feel free to share down below in the comments.